And This Blog By Any Other Name. . .
1/16/06: Do You See Beauty In The Everyday? Happy Anniversairy to you and thanks for the lovely heart. It´s true, if one sees beauty in the little things at the path, everything seems lighter and easier. Or you could say that your heart is emerging from this place. Or your heart is growing in this place. Or that you have a heart of stone, but probably not that one. This post is very moving. Reading your blog and seeing your beautiful photographs is the best part of my workday. Great Rock! I need to start looking for these guys around me - I am amazed at how many you have found! My little girl really loves seeing them in your pictures. Hey Farmgirl. I took your advice on the book Bread Alone. I love it. Thank you! I haven't visited your blog for a while but it was so beautiful to read about your preparations for a freeze-in. Here in Australia we are sweltering in 39 degrees celcius. We're suffering a severe drought (99% of our state is drought declared, and the town where our farm is has only 3 weeks of water left for the population), horrific bushfires which are spreading over 4 states and we are praying desperately for rain. How different our lives are! i just found your blog -- actually i was directed to visit by one of my blog readers. 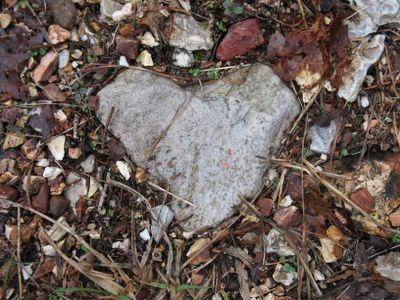 i love the rock...finding a little treasure in an unexpected place is a good thing!